Whether at home, at work as founder and CEO of NEST Fragrances or contributing to philanthropic causes of autism and mental health, Laura Slatkin is always drawing on her interconnected worlds for inspiration. Since launching her line of home fragrances in 2008, Laura has built NEST into an enormously successful luxury lifestyle brand. And at home, her close family, including talented interior designer brother-in-law Howard Slatkin and creative entrepreneur husband Harry, has helped shape her glamorous New York City townhouse into a chic haven for family living and extensive entertaining. Join us for a visit and delicious lunch with Laura as we take a peek at her stylish and inspiring domain. 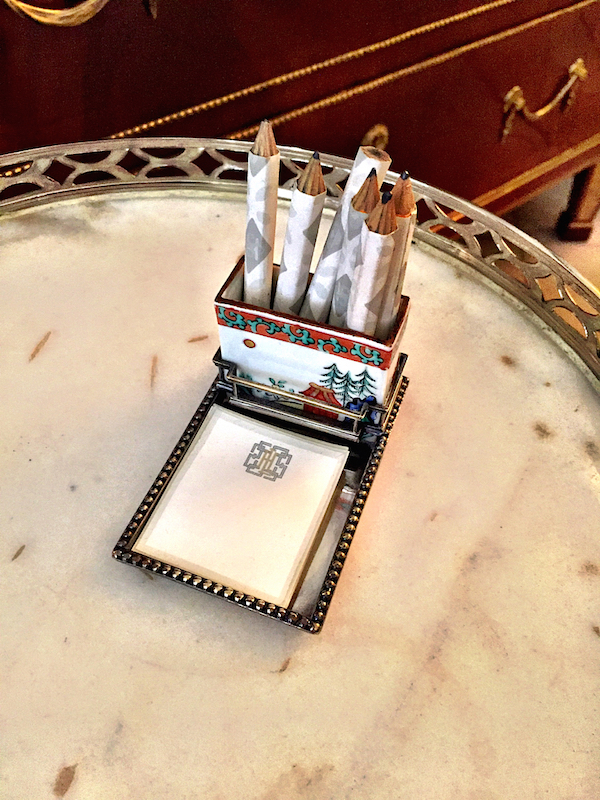 Everything in Harry and Laura Slatkin’s home has a story to tell and is a testament to thoughtful choices. Years ago a tradition was started that gift giving had to be a planned and personal exercise. No mere walking into emporiums even like Bergdorf’s or Hermès to buy a present. 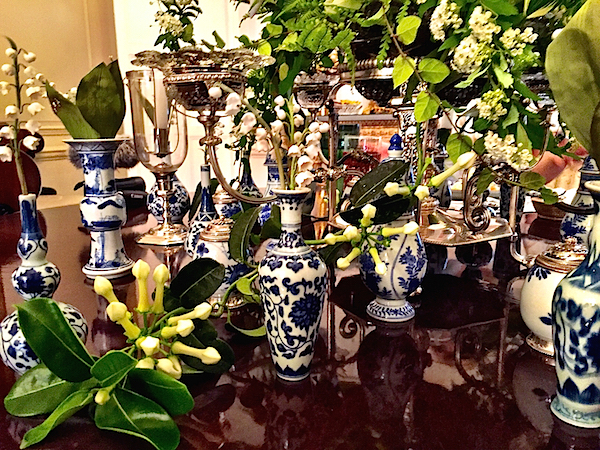 Decades of exchanging with Howard and each other has resulted in a collection of beautiful pieces for the home and entertaining that have special significance, such as these exquisite porcelain lily of the valley stems by Vladimir Kanevsky that Laura bought Harry for the holidays. 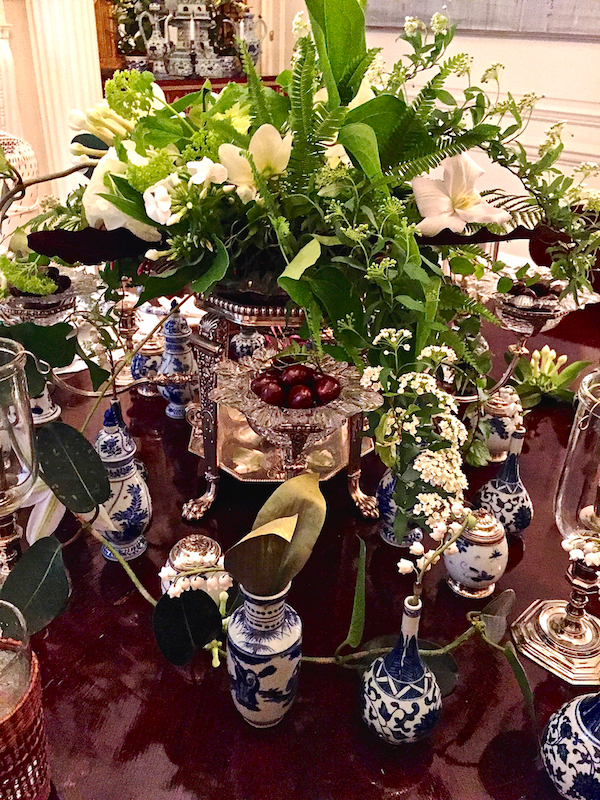 Set in a collection of antique blue and white bud vases, they provide a beautiful floral arrangement at any time of year. The fabulous epergne was an anniversary gift from Howard. Laura and Harry fill the dishes with delicious chocolates (a bit TOO delicious I might add) to tempt their guests with at dinner. And while the service at their house may be formal, run with Upstairs Downstairs precision, Laura is a relaxed and charming hostess. There is a palpable warmth and strength felt with fervent family ties, echoed in the visual strength of each room, united by a deft mix of antique furniture and modern art. Below, a contemporary Hervé Van der Straeten light fixture is reflected in an 18th century Venetian mirror. In the entry an antique chest, Giacometti scones and Eve Kaplan gilded mirror seem made for each other, enhanced by scent of course. 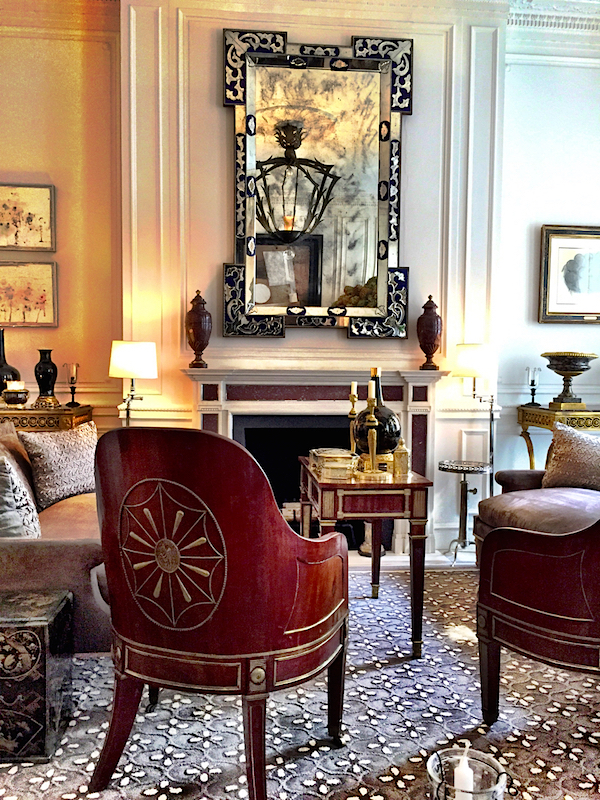 Laura Slatkin’s worlds are effortlessly intertwined and creative inspiration arises everywhere. When a dinner guest once inquired about the fragrance in their dining room, Laura realized it was emanating from the Persian Indian feast she was serving. It was an aha moment. The next day she brought the spices used for the meal to her master perfumer and Moroccan Amber was born. so does her business and dedication to philanthropy. You can be sure that whatever Laura does is approached with a meticulous professionalism and thoughtful eye to making life more beautiful and better for all. Thank you Laura for inviting us into your gracious home and world! We’re feeling inspired! And to be sure to never miss an episode of our video series, you can subscribe here . It’s just a click away! This entry posted in At Home with, furniture, gifts, interior design, Quintessence video series, Stylish Shopping. 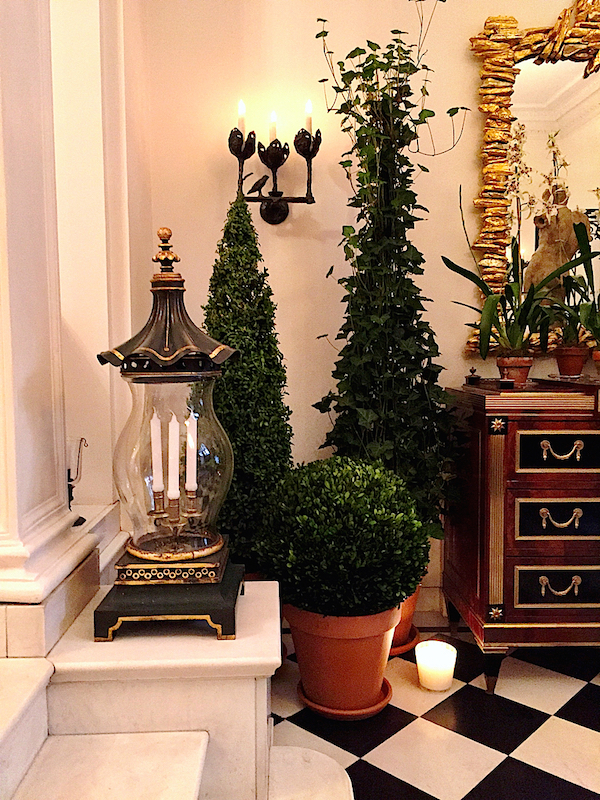 Entry Tags: At Home with, design video, Entertaining, interior design, Laura Slatkin, Luxury lifestyle, NEST Fragrances, scented candles Bookmark the permalink. Oh this was wonderful!! Once I found out that you were going to feature her home I could not wait to see it! I knew that it would be beautiful and that Laura would be just chic. Thank you! Already watching the video a second time! I have always found Laura and Harry to be so effortlessly chic. Everything they touch is perfection! Thanks so much for this! Thank you for being a loyal follower Fred! When we first started, we chose a favorite soundtrack, not realizing the attending issues. But now that we have continued to grow, we needed to find music to which we owned the rights. We’re so glad that you’ve enjoyed the series so far and hopefully you’ll grow to like our new music and fun opening. Thank you again for your viewership. As I’m sure Stacey will explain better, there actually was something wrong with us using that wonderful music in all our past videos: because we didn’t own the rights to it. The current music, we do. I’m so glad you’ve enjoyed our series’ content and hope you will stay tuned! Your writing and video coverage of Laura Slatkin is as thoughtful and aesthetically pleasing as her home and designs. I adore the new music and animated preface. Gorgeous! I have been looking forward to this video and I certainly wasn’t disappointed! Thank you both for this series, each one is always uniquely inspiring. Bonne continuation et un grand merci! Congratulations ! Very nice entry, good reading and watching. Always gorgeous,always inspiring , and Laura makes entertaining an art form.. Wonderful ladies! I love the illustrations at the beginning of your video and time with Laura. The Slatkin’s are such an amazing couple, with their philanthropy and entertaining! Nest fragrances have become a favorite. Howard first introduced me to Kanevsky’s artful flowers in his astonishingbook!! I thoroughly enjoyed viewing and reading your lovely post. 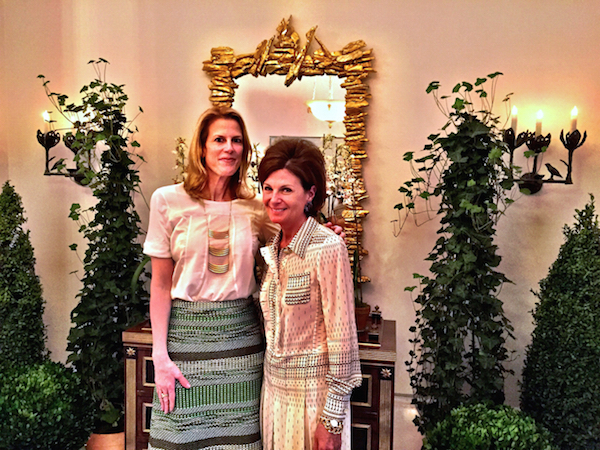 I am a huge NEST fan so it did not surprise me that Laura Slatkin was such a lovely and caring women. Just wonderful! Thank you for this much needed escapism today – can hardly wait for the next ‘At Home’ installment. And I love the new animated/illustrated introduction. Once again, a fabulous segment!!! Please do, give us the name and manufacturer of the beautiful white paint that she used in her house! Thank you so much for such a wonderful Monday morning treat! Thank you for such a fantastic video that lovingly captures my beautiful sister-in-law who I love so much, and for also capturing the warmth and happiness Laura and Harry bring to their home. Wonderful video. They have such beautiful taste! Is there a possibility that you could share with us the name of the white paint? It looked perfect. i sell nest in my shop and I love Laura and her brand. Any chance you could get the paint color and or the recip for the souffle?? Thank you! Oh yes, please do share. The paint color in particular was so important to the piece, it really would be a tease not to share. And recipes? The dessert soufflé looked equally delicious! 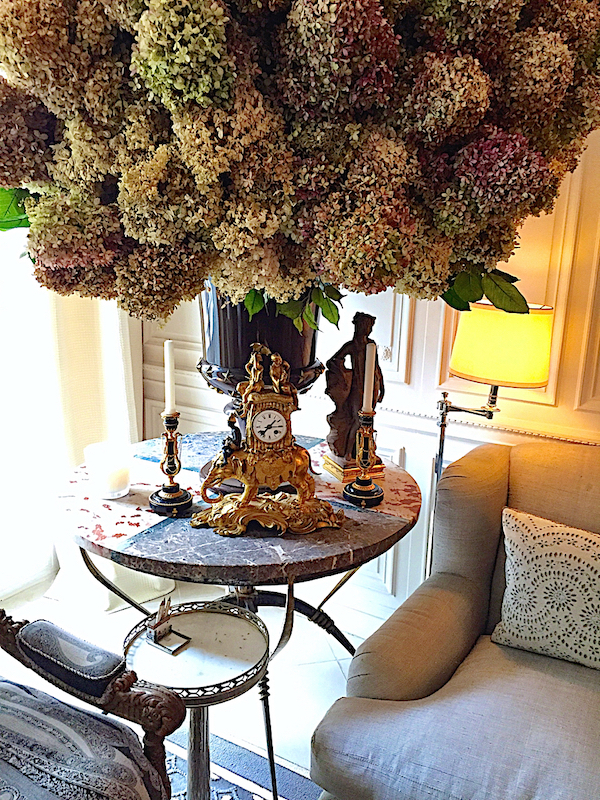 Okay – my avid hydrangea cutting and gathering in the Fall was just validated by that unbelievable bouquet! It’s as wonderful as I knew it would be. Chic, beautiful and effortless style…what could be better?! This video was a joy to watch! Could you possibly post the luscious looking pineapple pistachio souffle recipe? Such an interesting article and lovely photos and video featuring Mrs. Slatkin. Thank you much for posting this! May I have the recipes for the pineapple pistachio souffle and the pasta truffle souffle? Love viewing everything about Laura, she is so pretty and wonderful taste. I love the opening theme music to your videos. Can you share who composed it or the title of the music. I would love to purchase a copy of it for listening. This was a lovely presentation of absolute graciousness. Well done. Of course, I’m with Bonnie Morrow, the recipes to the pasta truffle soufflé and dessert soufflé is more than appreciated. Yes please recipes & paint color? Has anyone received the recipes and paint color? Thank you. I’m afraid the paint color is proprietary. Still working on the recipes. 88 queries in 0.975 seconds.